FXX’s big buy for The Simpsons library may have already paid off for the fledgling network, as its 12-day Simpsons marathon netted it the weekly crown for top-rated primetime cable network among 18 to 34 year-olds; it came in second, trailing only ESPN in 18 to 49 year-olds. The brands with primetime TV ad buys on the network must be particularly happy with their investment in FXX. 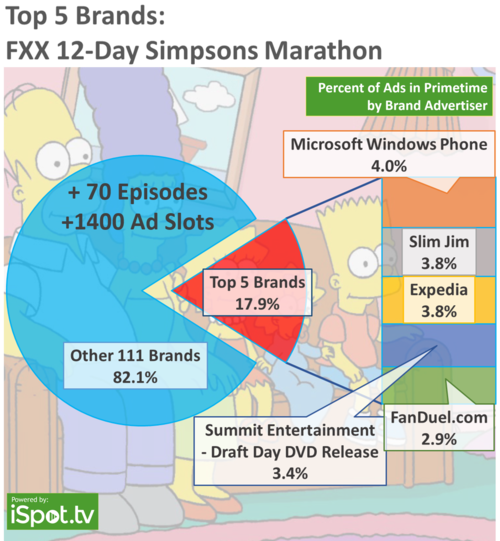 More than 115 brands ran spots on primetime during The Simpsons marathon, but five brands in particular accounted for nearly 20 percent of the airtime. Microsoft kept Cortana front and center by running, “Siri vs. Cortana: Happy Anniversary,” 58 times during the primetime Simpsons airings. Slim Jim’s campaign challenge to Jack Links was also a prominent presence, as the snack food brand ran three ads from its new competitive campaign – “Bellies,” “Possum” and “Cats” – totaling 56 spots on primetime FXX. Expedia continued its heavy spend behind “Find Your Nostalgia,” with 55 primetime airings. The brand spent primarily behind its 30-second spot, but also aired a 15-second version of the commercial. Summit Entertainment also used the sizeable audience opportunity to announce the DVD release of “Draft Day,” which aired 49 times during the marathon’s primetime run. Finally, FanDuel bought 43 primetime slots in the Simpsons marathon for its commercial, “Pep Talk.” The fantasy football site has made news recently for securing significant investment from venture capitalist. Appearing in this top five list demonstrates that FanDuel is, indeed, a brand to watch.